After a particularly relaxing day at Casa Aventura was turning to cocktail hour, we decided to venture out to restaurants along the shore of Los Muertos beach. Our standard routine of favorite restaurants, while delicious, had become well…routine, and we figured that we could expand our portfolio of favorite places by exploring seaside bar and grills in the Zona Romantica. We learned quickly that a small investment of time and pesos at each restaurant’s bar was far more valuable than any recommendation we could find on Yelp. Before we were going to give a restaurant one of our special days in paradise, we wanted to make sure they were worthy of the commitment. In fact, a great way to size up a place is by grabbing a seat at the bar, especially when that bar seems ignored by the beach-side table diners. Within a few minutes you can tell if a restaurant is catering to discerning locals, high end vacationers or is shamelessly positioned as a tourist trap. By sidling up to the bar, asking the bartender his favorite dish and if he could prepare you his favorite cocktail will tell you everything you need to know about the place. It also provides a cheap escape without any commitments. Los Muertos Beach is a great place to visit day or night. It can also be ‘hit or miss’ when it comes to dining. Implementing a ‘cocktail’ strategy is the perfect way to discern between the two. You might even find some amazing appetizers along the way. Vitea – The owners of ‘Taste’ (a great place for quality dining in downtown Puerto Vallarta) expanded on their success and opened a beachfront establishment with a wide variety of dining options and great seafood and pasta dishes. The view is exceptional for sunsets and people watching along the malecon. Vitea is family friendly, has exceptional wait-staff and will make anything on the menu to your liking. Vitea offers great views of local fireworks shows and lots of foot traffic. Great chance to snap photos and allow cagey kids to get out some energy all within view of your table. La Palapa – One of the original Puerto Vallarta establishments (circa 1957), La Palapa has been serving great food and great cocktails for decades. 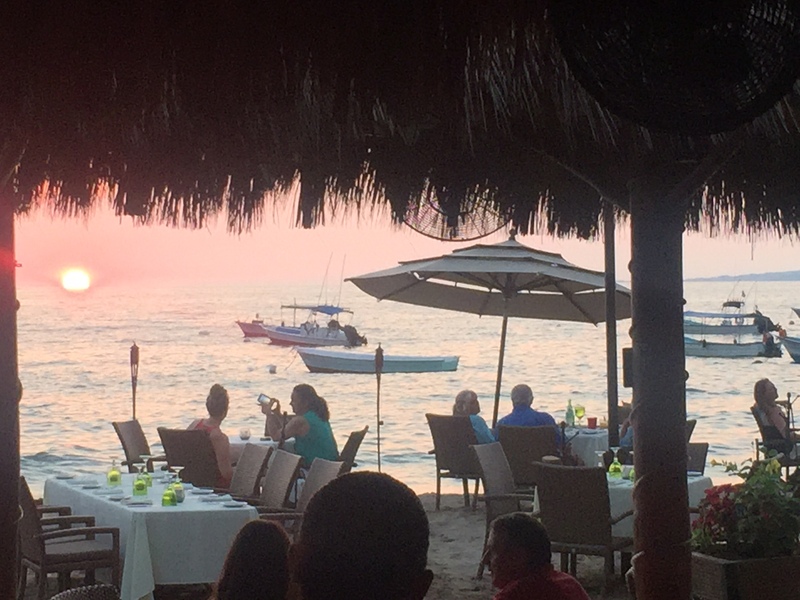 Great views day, evening and night from La Palapa along with a warm, inviting atmosphere that lends itself to slow, relaxed evenings. The bartender, Roberto, has been at La Palapa for over twenty five years and once you’ve had his cocktails – you’ll know why. Roberto commands a masterful understanding of blending local flavors and spirits in the many drinks he’s created over the years. Enjoy a flight of Roberto’s margaritas; Tequilas, Mezcals and Raicilla spirits blended with passion fruits, cactus blossoms, basil and slight hints of jalapeño. One of our favorites had green olives. Until we met Roberto we thought green olives were just for Martinis. We’ll certainly be adding more places in the coming months. In the meantime, enjoy and let us know of any places we need to explore.